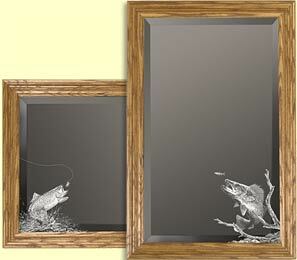 An etched fisherman mirror makes a great gift for the sportsmen in your family. 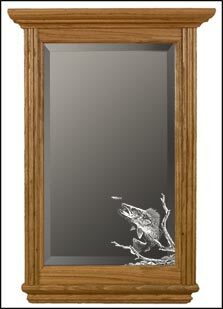 Our decorative etched mirrors are framed in solid wood. There are many different styles to choose from. We can make a personalized wood framed mirror using your text or logo etched mirrors with a company logo. 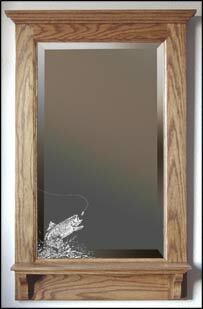 We also have a variety of hunting themed mirrors and other decorative etched mirrors as well as fishing themed clocks. available in oak, walnut, or cherry. with your text, image or logo. Combine a fishing themed mirror with a bench and a fishing themed clock for your anglers decor. 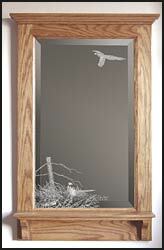 Standard Mirror Size not including frame: Rectangle: 14" x 23 1/2"
Octagon: 14 5/8" x 23 3/4"
Please contact us if you have any questions or want a price on a custom size. Can hang horizontal or vertical. 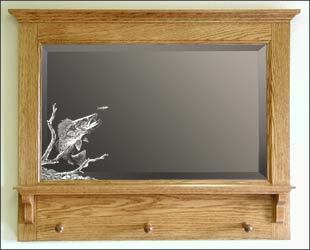 Also available in walnut or cherry, other woods can be special ordered. 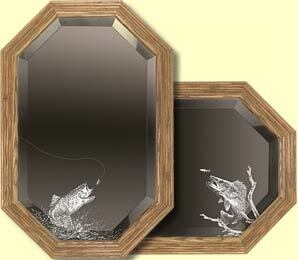 Shelf Size: 3" x 27 1/4"
Size of the actual mirror is 23 1/2" wide x 14" tall. Size 2: 36" wide (Crown is 37 3/4" side) x 23" tall. Shelf is 36" x 3"
Size of the actual mirror is 32" wide x 14" tall. 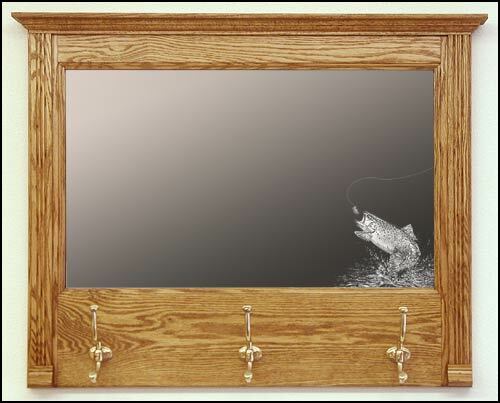 Mirror Size: 14" x 23 1/2"
Frame size as shown: 17 3/4" x 30 1/2"
Frame size is 18 1/2 " x 30 1/2"
We can make custom sized mirrors. Contact us for pricing. 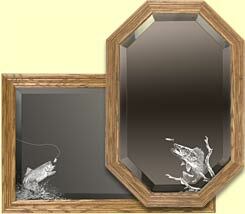 You can choose one of these stains: Stain Images- Other stains can be custom ordered. Do You Have A Question or Would You Like A Custom Quote?